The San Francisco Urban-Rural Roundtable made recommendations to then Mayor Gavin Newsom on how San Francisco City and County can support the regional agricultural economy and make high quality, sustainably produced, and regionally sourced food available to all residents regardless of income level. The time frame for this project was September 2008. In September of 2008, San Francisco Mayor Gavin Newsom invited 50 leaders from city and country, including California’s Secretary of Food and Agriculture, AG Kawamura, to convene three times over five months in order to prototype an urban-rural collaboration in the development of a “foodshed” for the City. 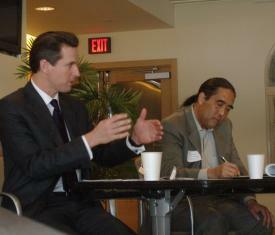 In September of 2008, San Francisco Mayor Gavin Newsom invited 50 leaders from city and country, including California’s Secretary of Food and Agriculture, AG Kawamura, to convene three times over five months in order to prototype an urban-rural collaboration in the development of a “foodshed” for the City. Four committees were formed: Place-based Agriculture, Aquaculture, and Cultural Values; Resources and Environment; Healthy Food Access; and Agricultural Economic Viability. The Urban-Rural Roundtable provided a tangible opportunity for city and country stakeholders from across the food system to create a sustainable, place-based food system. Error: Error validating access token: Session has expired on Tuesday, 26-Mar-19 12:54:16 PDT. The current time is Sunday, 21-Apr-19 07:34:36 PDT.